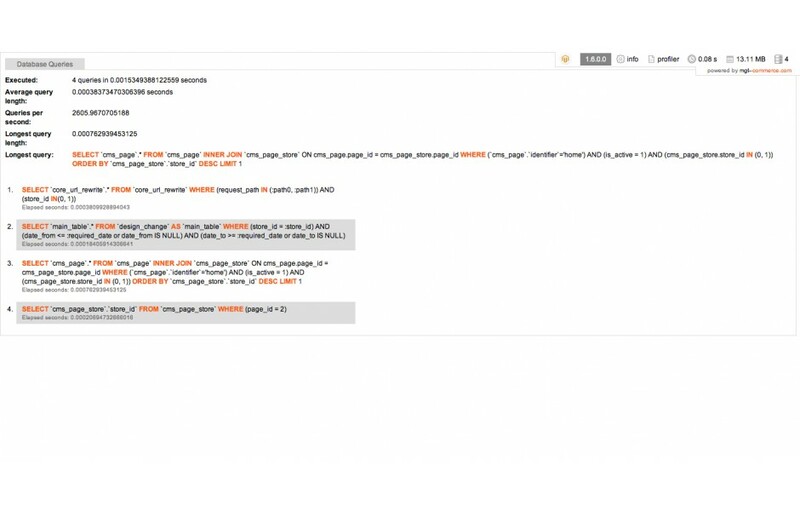 A great extension for analyze your magento shop and a better overview about magento shop code. 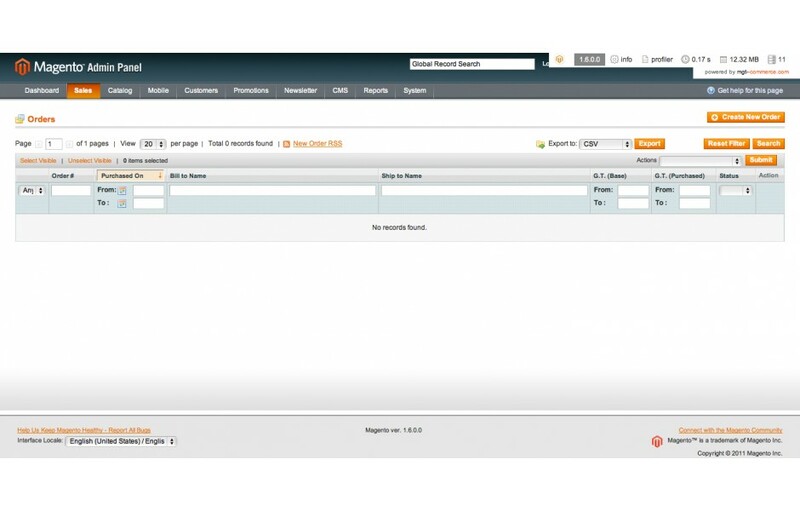 Professional magento developer toolbar with profiling, database queries, handles, event/observer overview, block nesting, requests and caching. 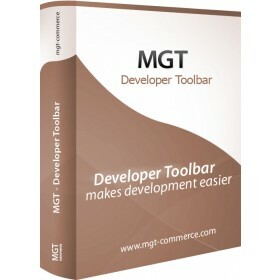 The Mgt Developer Toolbar for magento is very useful for all developers and frontend guys. Many professional developers all over the world use this extension to find possible performance bottlenecks. 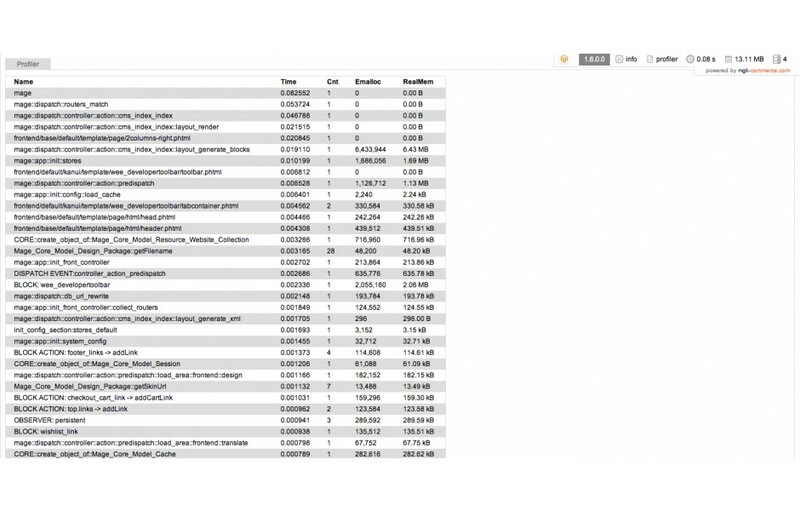 You have an overview of the parse time, memory consumption and number of queries executed. It also gives you information about the Controller, Module and Action which is responsible for the current request. The advantage for frontend guys should also be mentioned, you get a complete overview how the blocks are rendered and which templates are used. This makes all block and template changes easier than ever before. Give it a try, you will never ever work without this developer toolbar! It provides very vital information for customising Magento.It saves a lot of time in trying to understand the different components for each rendered HTML page. Worked great. It really help me a lot while implementing coding and optimizing code. This is an excellent extension and a must have tool for any Magento developer. A must have extension for development. This is a very helpful module, especially for profiling where performance problems are with database queries, etc. I wish I'd found this module sooner, it's an excellent developer tool. This is very useful tool. 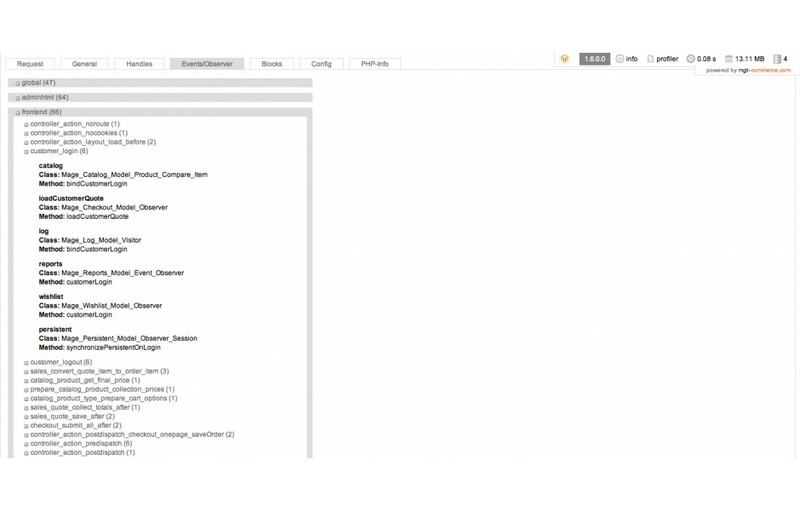 Perfect element for debugging module in magento. Great software. Helped me to diagnose an error in an addon within minutes, rather than possibly hours. Great toolbar. Nice! Support custom extension (tabs, modules). Simple integration. Really, this helps a lot - you can see handles, turn on template path hints and inline translations, see the blocks and controller of the page. Recently started using profiler tab - helps a lot to detect performance leaks. I start all my project with installing MGT-developer toolbar, recommend to everyone. Did use this extension during development of many solutions, never had a problem with it. I've developed over 50 Magento site before discovering this extension. I really wish I had used it from the beginning! For theme development it is an invaluable tool, showing all the layout handles and blocks for each page in a simple 'web developer' style toolbar. 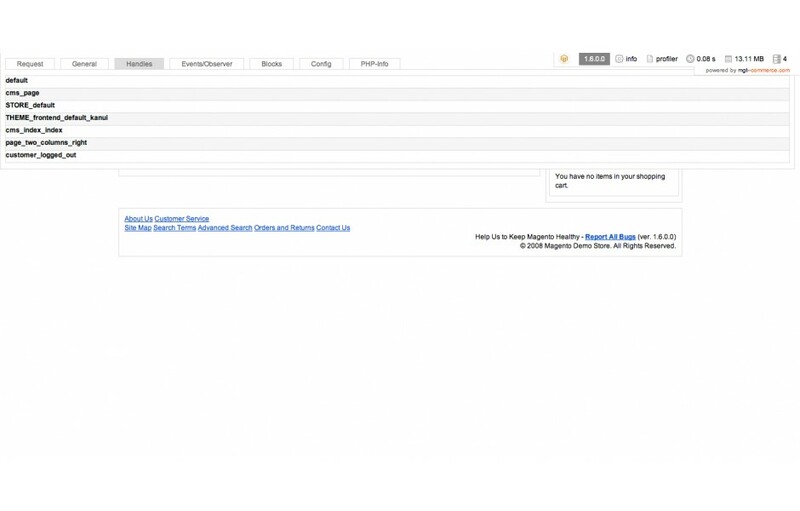 It also shows lots more information about all the processes Magento is running on each page. I will be using this extension on all my Magento site from now on. Cheers guys for releasing this for free! This is an excelent module to debug and find out problem with database queries. It could be helpful for QA too to determine problems on the site related to wrond developed queries. This is great extension, one of must have for every developer. First thing I always install when starting a magento development. Endlich alle Abfragen sichtbar und MAgento wird transparent. Wenn die MGT Erweiterungen in den eigenen Design Ordner kopiert werden funktioniert es perfekt. Along with step-debugging, this is an essential tool. Well done, thanks. Really helped me to debug slow Magento site. Ccurrent functionality is perfect and really helpful. This one is a must for any serious development whether you're using it for the back-end or front-end. And it's free! Thanks guys. I have used this extension, it is very good for every developer. Thank you very much. As a Magento Certified Developer I can really recommend this extension during development of any Magento webshop. The extension can give you quick insides in potential problems and really speeds up development. A must have! Since installing this, I wonder how I could waste time not having a handy thing like that, being all packed with usefull information. Thanks for providing this for free, in 5 star quality! Verry powerfull tooll that really helps me speed up my development of magento shops. Thumbs up! This extension installed easily and works as stated. Good to have. This extension makes the work much easier. Contains very useful tools. Thanks for the team of Mgt-Commerce.com. Nice product, easy to install, works well. Definitely part of our standard install now. I needed a quick way to see what code was killing one of my magento websites and using MGT Developer Toolbar I managed to reduce the loading time from 10s to 1-2s by optimizing some 3rd party extensions. Great development tool. Development assistance Extent to which situations can debug, development, modification, translation, and its easy installation and its enormous benefits. Tested on magento version 1.7.2.0. Thanks to mgt-commerce.com for this extension available to the community, keep up the excellent work. I use this extension and it save lots of my time in developing. Great for debugging. Really useful to find those pesky blocks and templates in use. Always problems founding out why things do not work in Magento? This extension has helped us a lot in quickly pinpointing the cause of errors. Recommended to anyone doing code/extensions in Magento. Installation was straight forward. And no conflicts with the many extensions we use on our instal. One of the best developer extension i have used! It increases development speed. For all developers and administrators of the store. Very good to know what is happening, debug and fix some code! Use without moderation! Since I installed it, I have improved my performance programming. This module is just essential for editing, creating, optimize modules. I recommand it for all magento's developpers. I love this tool. It has helped me a lot with me development. Thanks a lot MGT-COMMERCE ! I installed this extension few days back and its really very good toolbar to debug the application and I will recommend my all of friends to use this toolbar. Die Toolbar ist mit den Weiterentwicklungen ganz klasse, Vielen herzlichen Dank und weiterhin viel Erfolg. This extension is very simple to use and full of informations. This plugin is a must have any Magento Developer!! 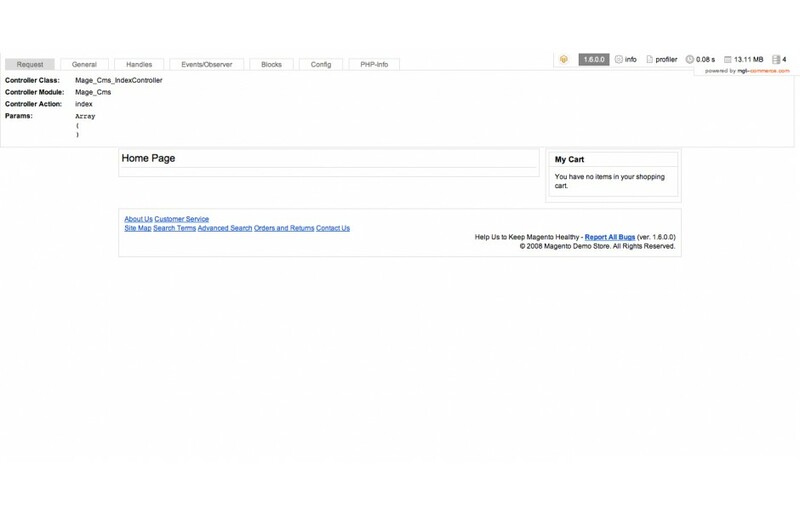 The Developer Toolbar is a really great tool that makes Magento development easier and faster. 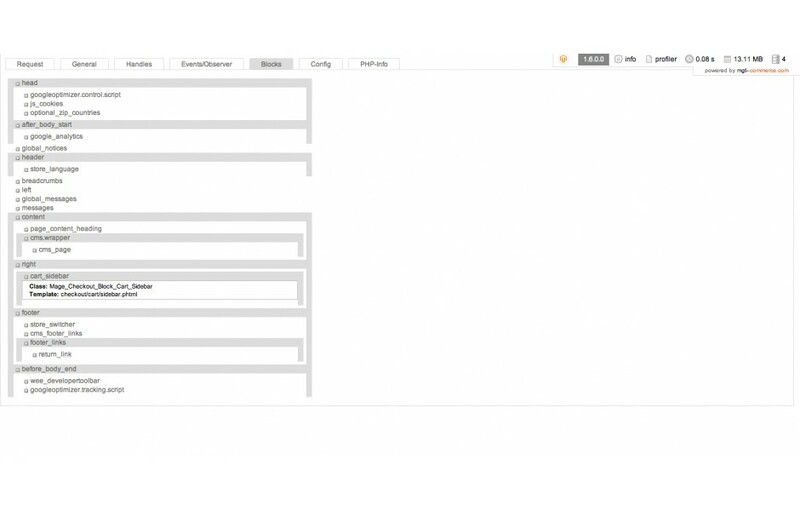 Great magento deverloper extension ! Great product, very useful ! To be frankly, all Magento developer's must have this tool. They supported us very well and very nice. There are best sql profiler. It most like me. Super. Thanks. I tried to implement a small extension for a presentation and had real problems while extending a layout-xml. This extension is the tool to look into magento and find bugs in your code. as always great product from MGT! Good module for developers. Thank you! Thank you for the extension. It is nice and useful, I will use it for all my projects. One place, all information! excellent! Very helpful for developing Magento-Extension or for Customozing it. Thank you very much! Very helpful and really easy to use! this module saves me a lot of time. 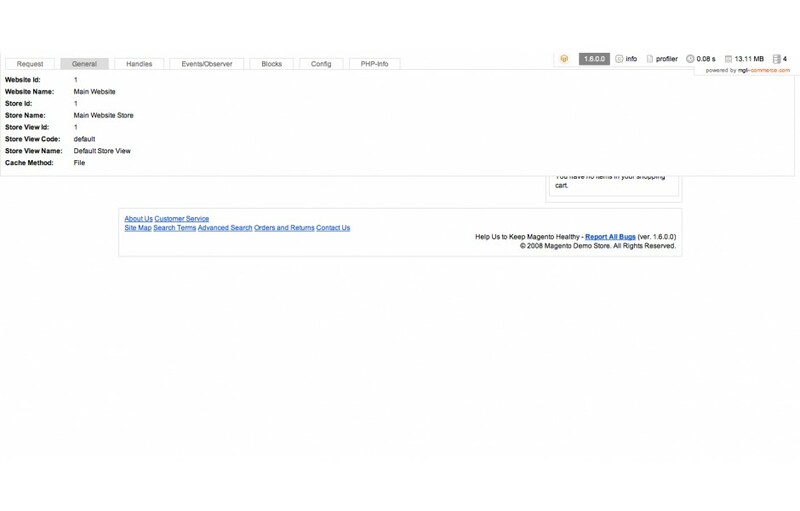 I was searching for something like the Symfony toolbar for Magento. This one looks great, works great and easy to install. I would recommand this module to all Magento developers. Thanks! I installed it on 1.4.2.0 and it works great! Works like a charm! You're a real hacker dude ;) Thanks!